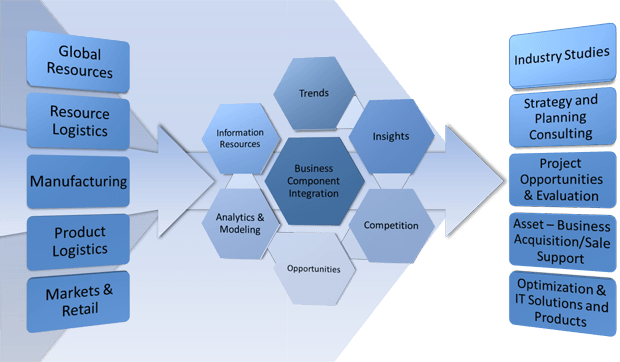 EAI Inc. (Energy Analysts International) provides bottom-up information resources and advanced analytics driven by in-depth industry insights supporting standardized industry studies, cost effective custom consulting and automated support services. EAI, Inc. (Energy Analysts International) was founded in 1982 with a mission to provide strategic consulting, products and technical services built upon thorough information resources, advanced analytics and a clear vision of client and product objectives. To achieve and continue this mission, EAI, Inc. has evolved proprietary information resources, application tools/software and a series of leading edge products to support a standardized and process oriented approach to consulting and product creation. These unique capabilities and approach are supported by a dedicated team of multi-disciplinary professionals averaging 15 years of direct industry experience and over 10 years of service with EAI, Inc.
EAI, Inc. applies its information, analytics and business/objective formulation process across the energy business spectrum including resources, logistics, manufacturing, pricing and supply economics and markets with focus on crude oil, refined products, natural gas and natural gas liquids. EAI, Inc. offers a combination of detailed study products, custom consulting, and retainer services with a commitment to providing superior value to its clients. EAI, Inc. has worked with a wide range of companies including international energy firms, independent refiners, resource development firms, investment institutions, marketing companies and retailers, transportation companies and government agencies for over thirty years offering industry expertise across a variety of business areas and segments at the global, regional, asset and resource level of detail. EAI, Inc. consultants are at the forefront of the industry and always monitoring and assessing current issues and trends that have implications for our clients and the immediate business environment. Our greatest testimony to the uniqueness and value of our products is our high level of repeat business and long term relationships with both the largest and some of the smallest companies in the industry.